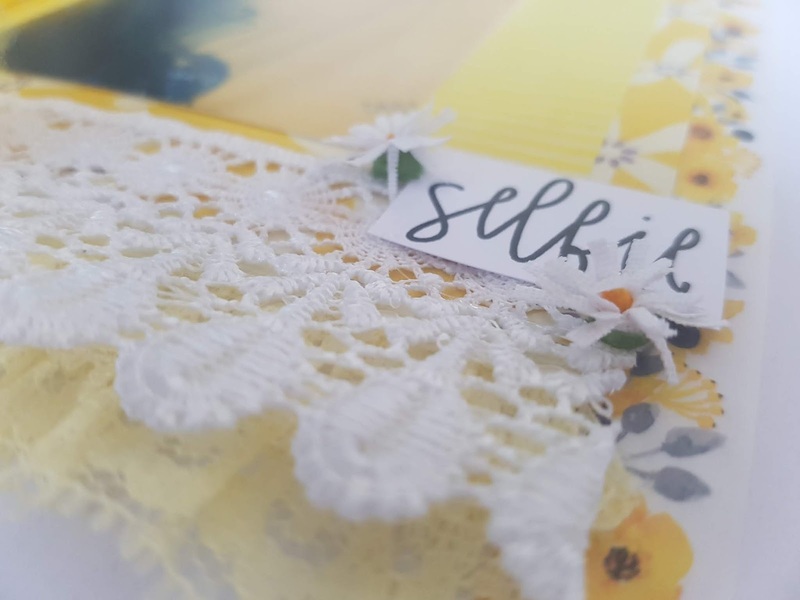 I was so excited when I saw the August colour for White with 1as it is one of the colours featured in the Scrapping Fun Kits, September 2018 Kit so you are getting a special sneak peek of September with this layout. 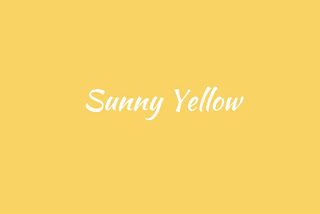 There is a Special Offer for White with 1 fans and Scrapping Fun Kits fans, if you order and pay for the August and September Kits the September will ship with your August Kit, so if you order in the first week of the month depending on how the post is going it should reach you with enough time to create a gorgeous layout for August White with 1. This offer is only available to Australian residents due to the delays that can occur with International Post. Unfortunately I forgot to use this month's sketch but my layout kind of turned out looking like the sketch so I wonder if it was in the back of my mind while I was creating. 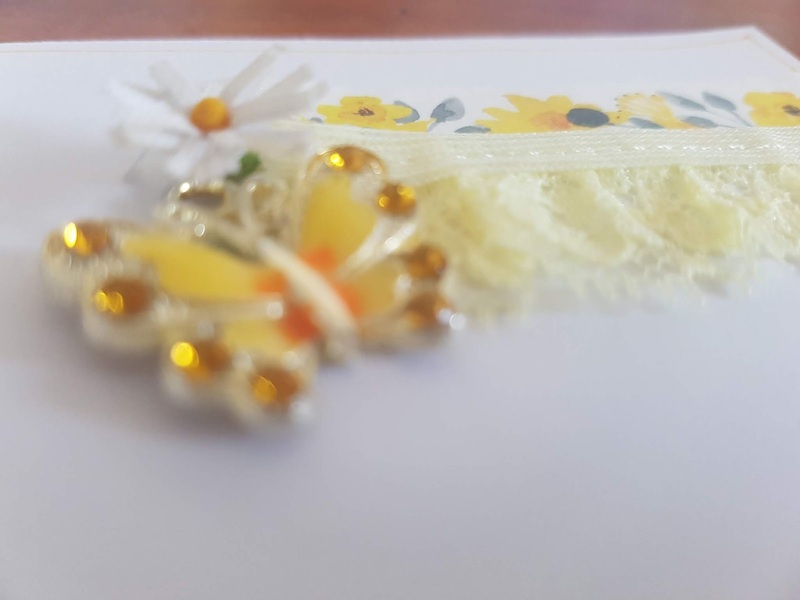 In addition to the gorgeous Yellow items from the September 2018 Kit I used the White lace and daisies from the August 2018 Kit, the white flower from our School Kit and the Yellow butterfly charm from the September 2017 kit. I started with the gorgeous Yellow Daisy paper and placed my 3 photos I was trying to decide on on it to work out which one suited this paper best. Once that photo was decided on I knew I needed to use the Selfie word with this photo. It is a selfie my daughter took in the car mirror on her way to her first ever day volunteering to fundraise for Starlight Children's Foundation. I then played with the flowers to created a cluster and the lace from the August kit. Once I had a basic idea of how this would work I started gluing things down with Helmar Acid Free Glue and Helmar Craft Glue. 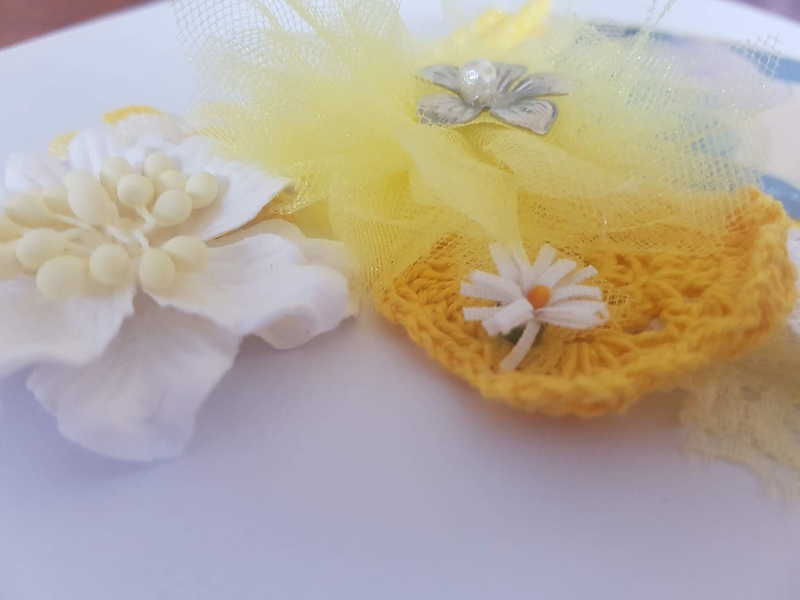 The little daisies from the August 2018 Kit added a lovely little pop to the flower cluster. 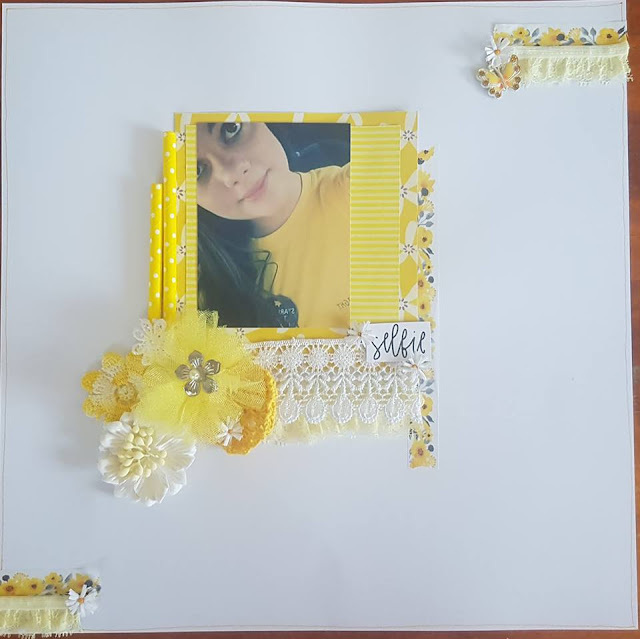 I added the yellow straw and vintage crochet flower to the left side of the paper and flower cluster, along with the white lace daisy from the August 2018 Kit, it really helped finish off the main part of the layout. Once I had the main part of the layout done I felt it needed something else so I decided to add some of this gorgeous washi to the top right and bottom left corner and to pull it in with the main part of the layout I added a piece under the main part of the layout, thankfully I hadn't glued the paper all the way to the edge. 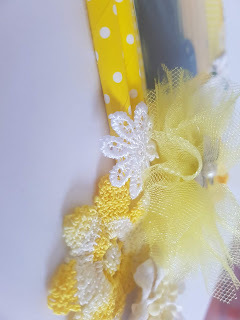 I decided to add some of the yellow lace to the washi on the corners so then added it under the white lace to pull that in too. I added a layer under the middle of the white lace which gives a nice hint through the white. 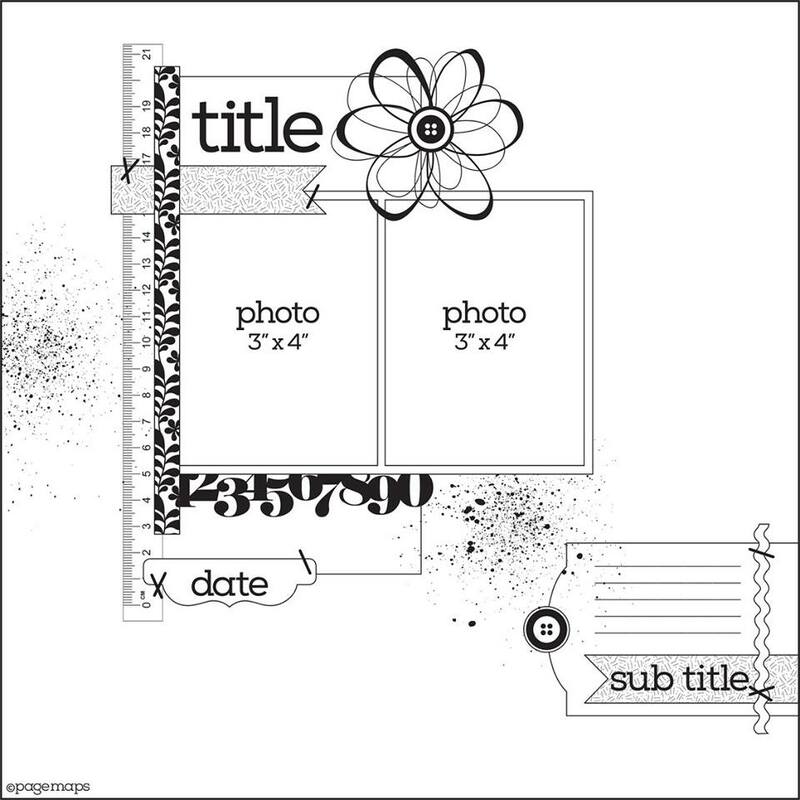 I also added the little daisies to the corner clusters to help make the corner clusters balance with the rest of the layout. 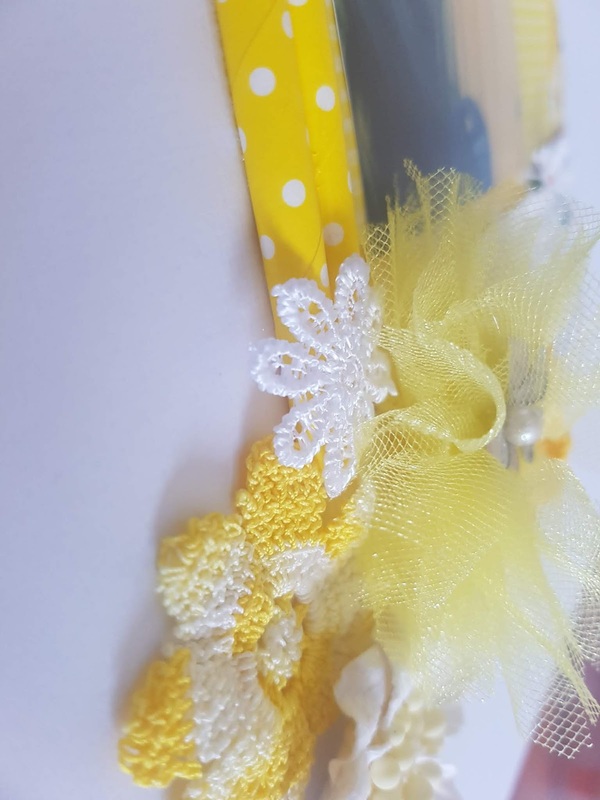 And I finished off the top cluster with this Yellow Butterfly Charm from the September 2017 Kit. I finished my layout with a yellow doodle border, off camera. I love the finished layout. There are still a few spaces left for August and September so if you would love these kits head to the Subscription Tab and fill in the form. If you want both click for a single kit enter September in the promo code so I know you want a 2 month subscription.